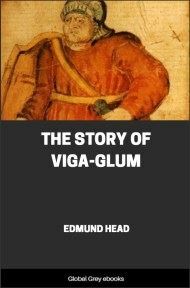 Víga-Glúms saga is one of the Icelanders' sagas. 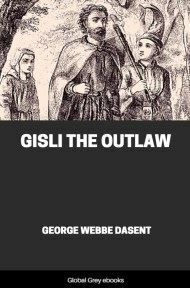 It tells of a chieftain who kills several people and tries to cover his guilt. 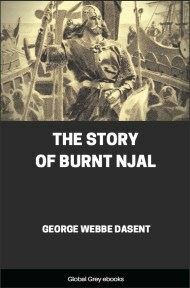 It is believed to have been written in the 13th century. THERE was a man called Ingiald, who lived at Thverá, on the Eyjafirth; he was one of the original priests and a great chief, and he was already in years when this story begins. Ingiald was married, and had two sons, Steinolf and Eyiolf, both right good men and fair to see. Ingiald himself was self-willed, reserved, hard to deal with, and obstinate. He cared little for merchants, and did not choose to submit to their arrogance. If he wanted anything from them, he preferred sending other people for it to going himself. One summer a ship came into Eyjafirth, the master of which was named Hreidar: he was a man of great family, who had his home at Vorz in Norway, and was very courageous and very popular. Ingiald’s son, Eyiolf, was often about the ship in the course of the summer, and he and Hreidar became great friends. Hreidar told him he should like to pass the winter here in some house, and from the report he had heard he should prefer that of Ingiald. Eyiolf said that such was not his father’s wont, but still that he would see about it. When he came home, he spoke to his father and asked him to take the master of the ship into his house--that he was a good, worthy fellow--and pleaded strongly in his behalf. Ingiald replied, "If you have invited him already, what is the use of talking about it? I must bear my part in meeting the expense, and you must bear yours in taking all the trouble;" but he added that he had never had a foreigner staying with him before and that he was still not desirous of doing so. Then Eyiolf answered, "It has not yet been settled without your consent; but I have not had much share in the management of the house as yet, and it seems your will that I should not have much, if a guest is not to be received whom I have invited hither." "Well," said Ingiald, "you shall have your own way in this matter, and the master and one other man may come here. I shall make no charge, for your sake; but you must take all the trouble for them, and I will defray the cost." "I am well pleased," replied Eyiolf, "that so it should be." 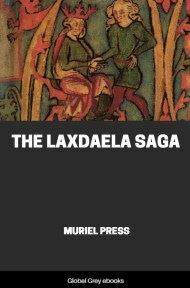 Eyiolf went the next day, found Hreidar, and told him how matters stood, whereupon Hreidar expressed his satisfaction and betook himself, with his cargo, to Ingiald’s house. A short time afterwards he learned that there was to be a great gathering there at Christmas. In the meantime Ingiald, though reserved, was on good terms with him. One day Hreidar asked Ingiald to go into the outhouse where his cargo was; and when he went he invited him to choose whatever he liked out of his goods. Ingiald said that he did not wish to take any of his property, but acknowledged his liberality. Hreidar replied, "I have, however, thought of something that you may want from us. I have been in several of the best dwellings here in Eyjafirth, and I have seen none so good as this; but the hangings for your hall are not such as to surpass those of other people." 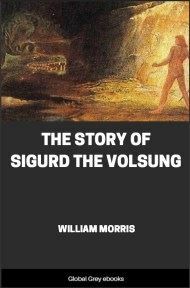 So saying, he took from his chests a set of hangings of such quality that no better had ever come to Iceland, and gave them to Ingiald, who thanked him; and a friendly feeling was now established between them. 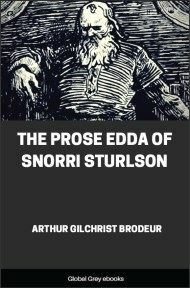 In the course of the winter Eyiolf said that he should like to sail with Hreidar on his outward voyage, but Hreidar did not answer him very readily. "Why," says Eyiolf, "will you not take me with you? Do you not like me?" "I like you right well, but your father will not approve of such a return for his hospitality, and I should not like to repay his kindness by taking away a son who is such a credit to him. If he approves, I shall willingly take you with me, and be truly thankful for your going." Now the traders prepared for their voyage, and when they were ready, Eyiolf again asked Hreidar about taking him out: he told him what he wanted, and how he did not mean to act in this matter against his father’s wishes. Afterwards, he told his father how anxious he was to go, and what had passed between himself and Hreidar. 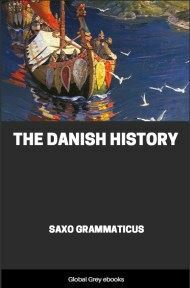 Ingiald said there were few such mean as Hreidar to be found, "and what with your own conduct and his tried worth, I shall allow you to go, for I am sure you had better make the voyage with him than with any one else."